These columns by Kimn Swenson Gollnick first appeared in SpiritLedWriter.com and earlier issues of Northwest Author by the Northwest Christian Writers' Association. NOTE: No portions of this page may be duplicated or posted at another website or stored in any form without the express written permission from the author. Copyright © Kimn Swenson Gollnick. ALL RIGHTS RESERVED. CLICK HERE TO READ CURRENT COLUMN BELOW. One of my students, a ninth grade boy, didn't know what to write for an assignment until we talked about how he felt about the Sept. 11th attacks on America. He decided to deal with the tragic devastation by writing about it--not essay, not poetry, but fiction. He created a fictional family, carefully crafting an opening scene with a boy and his father flying home when their plane is grounded. He plans to explore how news of the attacks impacts their relationship. On the surface, this is "writing what you know," because every American knows what happened on Sept. 11th. But on a deeper level, this is writing that heals, allowing the writer to sort out his feelings about what happened--and hopefully, guide us as his readers to do the same. Such is the power we hold as writers. Let us use it wisely, and well. Friend and business executive Bob Hiatt uses his quirky sense of humor to study people's reactions--on elevators. Most people look down at the floor or up at the numbers as soon as the doors close, so Bob helps them choose by commanding, "Everybody look down." Immediately, everyone looks around to make eye contact, something twinkly-eyed Bob enjoys. On other days, when the doors open, Bob (in pressed business suit and tie) leaps out as far as he can like a fourth grader, savoring the reactions he's left behind him. Sometimes, when the elevator is full, Bob waits until just after it starts moving to ask, "Did that sound like a cable unraveling?" Of course, he lets them know he's joking, but without a doubt he's broken the ice. Like Bob, we as writers can use the unexpected, the humorous, or the surprising to break through our readers' defenses and capture their attention. Play with words, propose new possibilities, think outside the "box," like Bob does on elevators. By doing so, we make eye contact with our readers, giving them the gift of our unique creativity and, perhaps, a fresh perspective. I'm navigating new waters by negotiating my first book contract from a publisher. However, it's not for my book; I'm ghostwriting a nonfiction book on finances. My arrangement with the co-authors is unusual, because instead of a flat fee, I will share in the advance and royalties along with getting my name on the cover. Not a bad deal. At the same time, I continue to receive rejections ("declines") for my juvenile adventure series. "Someday," I tell myself. "Lord willing, it will happen." How about you? Do your writing dreams continue to float just beyond the horizon? Don't give up. Try new things while improving your skills. Look for ways to bless others through your writing. God may surprise you with a sun break and the wind of new opportunities, if you're ready. Like wasps hovering outside my kitchen window, life's interruptions annoy me. The phone rings, but I'm working on this column. I must also finish a book and meet other deadlines before school starts--yet the grass keeps growing, the flowers need watering, the boys need attention, and what's for dinner tonight? The pastor needs the meeting minutes; the school needs input regarding my classes; and a new friend calls frequently (being new to Iowa, friends are a gift). In the midst of this, Russ and I decided to refinance. Calgon, take me away! So this week, I escaped with the kids for ice cream. Quietly, I also gave my concerns to God. "Lord," I prayed, "I want to be a good wife, mother, teacher, and friend, but I'm frazzled." He whispers it's not about what I accomplish--it's about loving Him and the people in my life. The needs may still buzz around me, but when I give them to God, He removes the sting. It's flu season and my entire family is sick. While I lament time lost from our schedules, I secretly appreciate this slower pace. "Down time" means more time for us to think, read, pray, and prioritize. No more hurry and scurry. No phone calls. No appointments. No expectations. Life boils down to one simple task: Get Well. I'm so used to writing, teaching, home schooling, and managing our home that facing only one task ("Get Well") is quite startling. I reflected on my earlier training as a graphic designer where I learned about "white space," places in which no text or design appears. Now I see how white space is important in one's life, too--time in which we plan nothing, or schedule in "down time." Easy to say, but not easy to do, particularly as the holidays loom ahead. However, surrounded by tissues and Aquafina bottles, this lesson is one I needed to experience again to remember the benefits of "Life's White Space." As frustrating as a writer's life can be at times, it also has advantages. For instance, my family's move across country allowed me, a Pacific Northwesterner with moss in her hair and rain in her blood, to learn new things about the life and people of the Midwest. A recent trip back to Seattle provided abundant material for travel articles and a potential "homeschooling-on-the-road" piece. But whether you travel or stay at home, every experience is fodder for article ideas, story settings, or character development. Each new relationship--whether acquaintance, friend, or disagreeable person--helps us understand another person's expectations and point of view, important elements when writing a persuasive article or suspense novel. All that's required is a sense of curiosity, a willingness to try new things, an attitude of thankfulness for whatever comes our way--and taking a moment to jot down these gems for future use. On a field trip with my boys last spring I saw a display case with Iowa inventions and discoveries that included the Red Delicious apple. HA! I thought. The Red Delicious apple is Washington's apple. I should know. I'm from Washington. And Washington State produces nearly half of the nation's supply of Red Delicious apples. Searching the Internet that afternoon I discovered--to my great astonishment--that the Red Delicious did not originate in Washington, but was indeed discovered by a farmer named Jesse Hiatt, on his farm in--you guessed it!--IOWA. For writers, this is a good example why it's best to check the facts, even when we think we know the truth. by the Washington Apple Commission. If there's anything we learned from this year's American Idol show--where hopeful singers crooned their way into homes across America every Tuesday and Wednesday night--it's this: Not all talent is the same. Nor can all talent win first place. But in a way, all the contestants became winners. The fact they showed up for auditions, took harsh criticism, and persevered means many of them achieved part of their dream to sing on a bigger stage. They also met new people in the business, and will probably reach unexpected doors of opportunity as a result. We writers should take note. Not all talent is the same. Neither are the doors of opportunity. But exchange fear for hope, send out those manuscripts, and let them sing. You never know what might happen. Nothing will, though, unless you stop dreaming and step up on that stage called publishing--and sing your heart out. Our tuxedo cat, Moses, has taken on airs. He seeks out fresh laundry to curl in for naps, and at lunch he regularly sits in a chair at the counter waiting for my son's turkey dog or ham sandwich. Dogs are good for security, but a cat? Moses is not useful for much other than affection--from us to him. My husband Russ recently made this observation: Who takes care of whom? Who feeds Moses, brushes his hair, provides fresh water, and even (ahem) cleans his unmentionables from his litter box? Our boys and we do. And Moses certainly doesn't reciprocate. We clearly serve him. Seen from his perspective, it's no wonder he puts on airs! Perspective is everything. Try this exercise with your characters: Explore a scene from different viewpoints. You might discover something you didn't notice before; perhaps character motivation, additional layers of plot, or a new resolution. It might be fun. And revealing. I admit, I'm hooked. Every day at five o'clock you'll find me watching a new television show in which a carpenter, a designer, and a professional organizer--doubling as clutter psychologists--conjure up spacious luxury for normal-but-messy people in their bedrooms and home offices in just 48 hours. Call it clutter voyeurism, but I'm fascinated. "Research," I told my husband, moving a pile of papers to see the TV better. "I'm getting ideas." This show hits home because writing a finance book last year got all my attention, but left me with piles to deal with--piles of books and research, pending projects, family papers, even Goodwill donations. Now, this show inspired me, and after concentrated effort (and an extra recycle bin), the family room belongs once again to my family. Yay! My office is next. What's my point? Like watching an organization show while sitting in the midst of clutter, we writers can get caught in "writerly" pursuits such as attending meetings and conferences, reading "how-to" books, posting notes in writers' elists, even doing research--all the while avoiding the real hands-on stuff of organizing our work, and then writing. How about you? Are you ready to get off the sofa and join me in doing some real work? Then let's get busy. "Your imagination is much more expansive than you realize; we are made in the image of God--look around at what He's created." "Let God reach [your audience's] hearts; use your words to connect to their minds." "If you stop writing, you will stop being a writer." "Writers don't fail; they quit." Which statement speaks to you the most? Type it up and post it near your work space. Let it inspire you to reach higher, longer, farther in your writing ...and don't give up! Actor Robin Williams riveted audiences as Professor Keating in the film Dead Poet's Society when he declared, "Carpe, carpe diem--seize the day, boys; make your lives extraordinary!" Who first wrote these famous Latin words proclaiming "Seize the day"? Curious, I looked it up. The son of a freed slave in Rome did, named Quintus Horatius Flaccus (65 BC to 8 BC). He's better known today as Horace, one of Rome's greatest poets. Have you ever "seized the day"? How did it turn out? Early in my career, I nervously approached the editor of our local writers' association newsletter. Seizing the moment, I asked about running my contests list as a regular column. To my great delight (followed by panic), she said yes! A few years later I worked up the courage, seizing the day, and introduced myself to the editor of my city's weekly newspaper, dropping off a sample news piece. She rewarded me with lucrative freelance assignments for the next two years. You could do the same. Ask to write columns or to report on news. What's the worst that could happen? The editor just might say "Yes"! I faced a realization last year when the director of our home school assistance program asked me to create and teach a course based on Strunk & White's The Elements of Style. Problem? I couldn't remember what was in it. The last time I'd opened Elements of Style stashed on a shelf back home was, well, eons ago, for a college writing class. In fact, the tattered copy we own isn't even mine, but my husband's! So I smiled and admitted that I looked forward to brushing up on The Elements of Style--and promptly rushed home to study the slim volume. The challenge was, in part, visualizing how to adapt the material for 7th, 8th, and 9th grade student writers who think their prose is perfect exactly as put on paper without any polishing or editing. But in brushing up on the rules of good writing (and re-writing), I saw I needed this stuff, too. Jean Jacques Rousseau wrote, "However great a man's natural talent may be, the art of writing cannot be learned all at once." Practice is good. Review is also good. To grow, we must continue learning and reviewing. I created a class handout listing the 22 rules of good writing taken from this classic work. Why not get yourself a copy of The Elements of Style by Strunk & White and make your own list? By the way, "White" of "Strunk & White" is none other than E.B. White, the author who wrote well-known favorites like Charlotte's Web, Trumpet of the Swan, and Stuart Little, favorite children's classics. By introducing this fact to my middle-grade students, I created interest in another book he wrote, a book of rules he followed as a writer. Do you participate in a critique group, either in person or online? Over the years, I've shared in several "live" in-person groups. I've also participated in online groups, managed one of the first critique groups in CompuServe, and eventually co-founded two critique groups--one in Washington state (with dear friend and author Joan Biggar Husby and friend Shannon Woodward, herself now a successful author! ), and most recently, one here in eastern Iowa. My newest group met last night; we absorbed the intellectual prose of our highly educated member, examined the thoughtful exegesis of Jesus' questions in a chapter by a pastor, giggled over the light romance chapter by our youngest married member, enjoyed the fresh fiction of our newest member, read an essay for a Chicken Soup project by yours truly, and shared good news about another veteran who'd been published several times last month. Two years ago, however, I didn't know these people. I'd left my beloved critique group in Washington state when my family moved to Iowa. I first visited critique groups in my new city--an oversized one at Barnes & Noble and a romance writers' group with a narrow focus, but neither group was a good fit. So remembering the positive experience in Washington, I started a new group in Iowa. At first, I met with another Christian author here and month after month, it was just the two of us. Finally, after two years and lots of turnover, our group grew. When my co-founder left for a life of travel with her retired husband, I kept the group going. My critique group now has a collection of six writers, with a committed core of three. We help each other, encourage each other, and pray for each other evey month. If you long for a group, check with your local writers' association or your Barnes & Noble bookstore; you may find exactly what you need. But if it's not a good fit, start your own critique group! What's stopping you? You'll be amazed at the difference both in the quality AND quantity of your writing. Samuel Clemens (Mark Twain) once said, “A classic is something that everybody wants to have read and nobody has read.” So to expand my anorexic literary knowledge, I enrolled in an “Interpretation of Literature” class on fiction. I discovered I didn’t like Edgar Allan Poe’s short stories, nor Nathaniel Hawthorne’s “Young Goodman Brown,” nor Kurt Vonnegut’s novel, Slaughterhouse V. These stories were too dark, too weird, and too gothic. Some of these classics we can’t all enjoy. Thankfully, midway through the semester I finally got to read some great stories, such as F. Scott Fitzgerald’s “Babylon Revisited,” Kate Chopin’s “The Story of the Hour,” and Stephen Crane’s “Open Boat.” If Stephen Crane sounds familiar, he also wrote The Red Badge of Courage (oops! another classic I have yet to read). Crane’s words in “The Open Boat” surrounded me on a gray expanse of ocean, where "Canton-flannel gulls . . . sometimes sat down on the sea, near patches of brown seaweed that rolled over the waves with a movement like carpets on a line in a gale.” Oooh, concrete imagery, fresh simile, specific detail. I felt I’d come to a feast where words satisfied like a five-course meal. Mmm, mmm. * Mark Twain is actually attributed with two quotes about classics, one written and one spoken. The one appearing in my column above is from a speech he gave in New York on November 20, 1900, called "The Disappearance of Literature." Another quote that's more elegant and better known is this one, which Clemens wrote in "Following the Equator, Pudd'nhead Wilson's New Calendar" published in 1897: "CLASSIC: a book which people praise and don't read." In a recent writing class, the professor instructed us to choose an item in the room and write down what immediately came to mind. I glanced around and chose “clock,” followed instantly by the word “dog.” That didn’t make any sense, so I quickly chose something else. Later I realized the connection and therefore, the power of the subconscious mind. My dog, Jeffie, died two years ago. Weighing just six pounds, he was my fuzzy Terrier-Poo, similar to a Yorkie. When I connected “dog” to “clock,” my subconscious mind thought of Jeffie, whom I’d loved for fifteen years—most of my adult life—but lost unexpectedly to kidney failure. “Clock” signifies time, the movement of which signifies the inevitableness of the end—the end of a writing assignment, let’s say, or the end of the day, or the end of a phase in life. Now it’s your turn. Give it a try. You’ll be surprised at the connections you make, which can serve as a springboard to deeper writing. 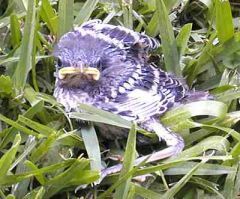 Today a fledgling bird appeared outside our front door, his body round and feathered with a few downy ones poking out in odd directions. He perched on the bristles of the boot scraper on our porch—perhaps he mistook it for a nest? An hour later he disappeared. I went out to mow the front lawn but was startled when he burst from a hiding spot near the driveway. He hopped, wobbily, onto our front walk, afraid and uncertain. To keep him from heading into the street, I shooed him toward sheltering bushes under our front windows. An Internet search showed me this stage lasts about two days; the parents are nearby to feed and watch over their baby. It seems rather frightening, however, because the fledgling is vulnerable until he learns to fly. I’ve got a new character who won’t leave me alone. His presence extends from two people I know—in real life, I mean—and I’m as certain as the seasons that their quirks will sneak into one of my stories. In fact, the pieces are already coming together from two completely unrelated events; a purchase last year on eBay, and these two personalities. The auction item inspired the plot, and the encounters provided details I can use to flesh out characters in my story. This caused me to reflect on whether stories must start with characters rather than plot. In this case, I felt both forces; a plot suggested by the item I purchased followed by my speculation about its history and the people involved. Then later, dealing with a couple of difficult people whose composite makes a great antagonist. Heh, heh. So I conclude that sometimes a plot plops into our laps first and all we can do is run with it, seek the characters who belong, invite them along, and see what new alleys, streets, and additional characters they lead us to as the adventure unfolds. And since we’re surrounded by real people with plenty of personality quirks and motives, we don’t really need reference books for characters. Practice observation and notation: watch for the unusual event (plot) and the quirky or difficult personality (character), and jot down notes for future use. If either plot or character takes hold, see where it takes you, or you might find ways to weave the two together to make a story. And watch out. You could find this exercise quite cathartic!